Which world leader resisted Donald Trump’s weird handshake the best? Who’s Winning the Trump Handshake Challenge? 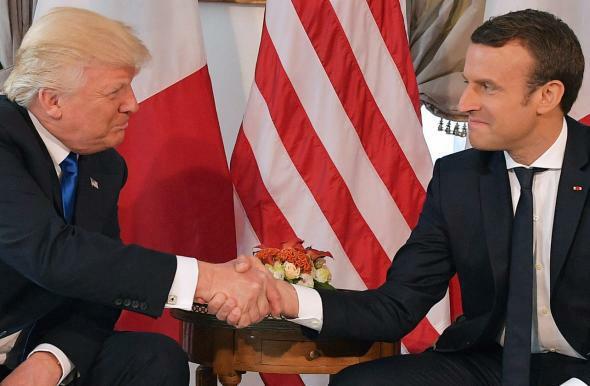 President Trump and President Macron hug with their fingers. When I was a little girl, my father, a salesman, taught me to always shake hands with a firm grip to make a strong first impression. Someone clearly gave a young Donald Trump that advice, too, but his toddler brain never adapted the info to accepted standards of human behavior. Now, every time the president must shake a fellow adult’s hand, he turns it into a cartoonish show of strength, pulling his partner’s hand to and fro, forcibly waggling his or her arm for an extended routine that looks both physically and emotionally painful. Trump has been in office for several months, giving world leaders ample time to catch on to his attempts at manual intimidation. In Slate’s Trump Handshake Challenge, statesmen are pitted against each other in a battle of the phalanges. There can only be one winner—or can there? Here’s how some recent contestants fared. The brand spanking new French president pulled two power moves against Trump. First, he executed a fake-out while walking to greet NATO leaders, swerving away from Trump’s outstretched bogeyman arms to greet German Chancellor Angela Merkel first. When he did say hello to Trump, Macron pushed the president’s arm away when Trump got too aggressive. Match nul. 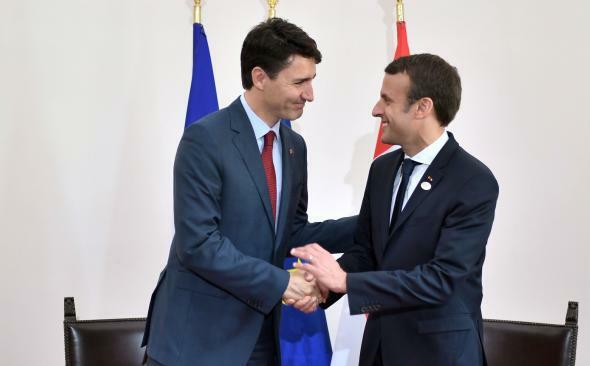 These Francophone hotties have shown utmost gumption and agility when forced to touch Donald Trump—Trudeau totally topped in his handshake, and if Macron’s was a shade too reactive, his denial of Trump’s open arms in favor of anti-fascist Merkel more than made up for it. So it’s Trudeau and Macron in a tie. Let’s celebrate with a friendly handshake, fellas! The co-winners of the Trump Handshake Challenge congratulate each other at the G7 Summit in Taormina, Italy, on May 26.